The Texas Board of Education thinks they can rewrite history. Now some on the Board are trying to take Neil Armstrong out of the social science textbooks because Armstrong “is not a scientist”. This is just the latest in a series of insane proposals being made in the Texas Board of Ed. Also proposed was taking negative facts about America out of the history books, putting Christmas in schools, minorities must be thankful to majorities, removing the word “propaganda” from U.S. history, and emphasizing GOP civil rights heroes (??). 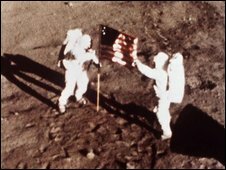 The other day, I read an amusing article in The Onion describing a supposed press conference where Neil Armstrong, first man on the moon, announced that he believed that the Apollo 11 moon landing (the very mission he flew) was a hoax. Of course I found the article rather hilarious because it quoted Armstrong as admitting that he believed it was real until being convinced by conspiracy theorist videos on YouTube and of course, because The Onion is not a real newspaper. It’s a satire on mainstream news. “We thought it was true so we printed it without checking,” associate editor Hasanuzzuman Khan told the AFP news agency. Both papers have apologized for the embarrassing error.